I’ve been carrying a camera for about two thirds of my life, but also slinging a guitar for around the same amount of time. These are two very dangerous vocations when it comes to what is known in tech/hardware obsessed circles as G.A.S. or Gear Acquisition Syndrome. Therefore, walking onto what is normally the concert floor of Williamsburg’s Brooklyn Bowl on Sunday, September 18 was not for the faint of heart guitar fan or the “G.A.S.sy”. Being surrounded by row after row of gorgeous Gibsons, Fenders, Gretsches and a unique selection of boutique six strings and basses was overwhelming. Where do you look first? How do you take it all in? Don’t you NEED one of each? 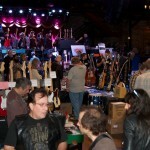 The 2011 Autumn Guitar Show offered free access to peruse the wears of vintage shops as well as new guitar, effects and amp builders. It was exciting to see so many young luthiers with their diverse visions of the perfect instrument. See the links below to their websites. 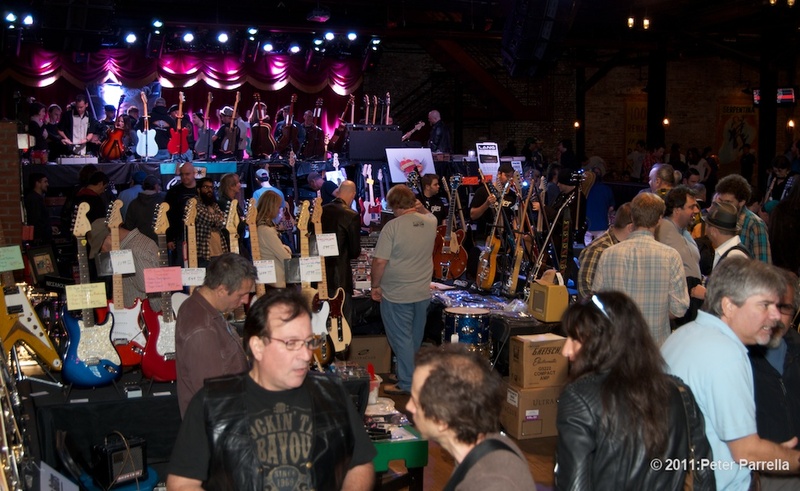 During the course of the afternoon I spied Steely Dan’s Walter Becker casually chatting with the vendors, metal stalwart Kenny Pierce representing his PiercingMetal webzine, his coverage of the show can be read here. Good friend Tommy F. was heralding the soon to be available on the East Coast Lang Amplifier line. Guitar Wear designer Jodi Head was there with her delicious array of beautifully rendered straps and accessories. The black leather with conchos and the briar rose pattern (pictured below) were two of my favorites. Congratulations to promoters/coordinators Lisa Sharken (Vintage Guitar Magazine) and DJ Uncle Mike on a great show. It was fun to mingle and chew the fat with like minded folks in a nice relaxed atmosphere that reminded me of the earliest days of Comic Cons (1969-70). A total SkeletonPete hat trick. Family bowling on the lanes, Kelso Nut Brown Lager on the taps, and a sea of curvaceous six strings. I hope guitar goddess Lisa and the gang do this again soon. Our Lady of the Shred? Great pictures! Thanks for the Lang amps mention! !